Khalid Alaraifi was kind enough to accept questions about the Apple iPad and he will answer based on his experience with the device. I asked the members of the facebook page to submit their questions about the iPad and I forwarded them to Khalid. He sent me the answers in Arabic and I have translated them to English as well. Can the iPad replace the laptop for university work? If you asked me a long time ago I would have said no but now my answer is yes especially if you bought the keyboard dock. iPad can read and edit (using an app from the iPad App store) all the office files. 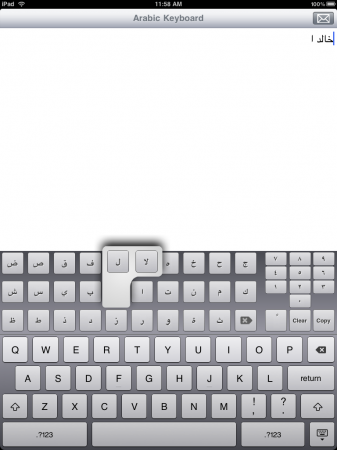 Is there a solution for typing in Arabic? Can the battery really reach 10 hours? Did you have problems with the Saudi iPad App Store? 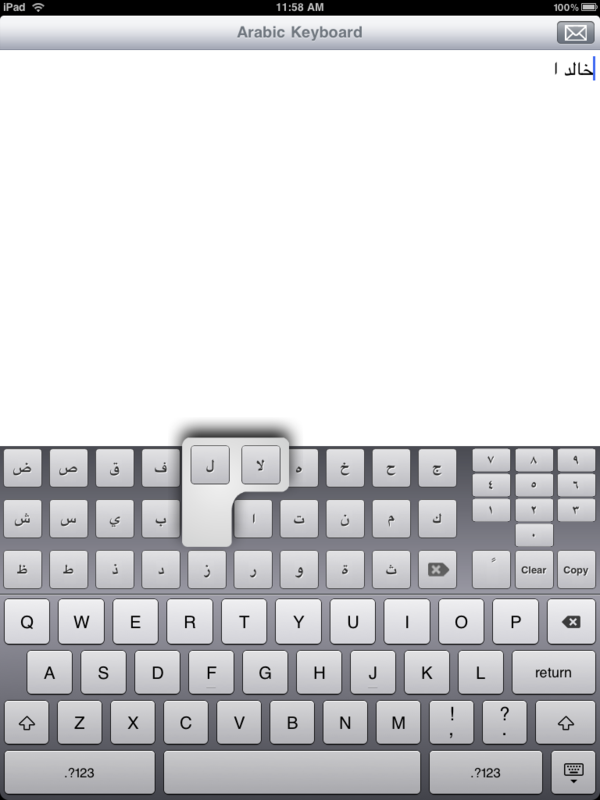 iPad doesn’t have an Arabic keyboard but you have 2 solutions for now: visit a website with a visual Arabic keyboard or install this iPad App. I didn’t monitor my use of the iPad battery. I used it a lot yesterday and battery level only reached %50. SaudiMac adds: David Pogue tried the iPad and it ran for over 12 hours. I didn’t try the Saudi iPad App Store but I read that there are iPad Apps on the Saudi store. 3.2 (7b367) you can download it from various websites if you’re interested. How can you read books? Does the iPad use e-ink? Can it read Arabic? What about Arabic PDF? I tried to look for an Arabic book in the iBooks store and I found nothing. iBooks currently doesn’t list Arabic as a supported language. iPad doesn’t use e-ink, it’s an LCD color display. I wanted to try AlRiyadh newspaper but they are deceiving us. They claim they offer a PDF version but it’s actually made with Flash, somehting not supported in the iPad. If you have more questions for Khalid then feel free to post it on this formspring page dedicated for the iPad. I have 1 important question. Now we know that ATT interduced micro-sim to be used with iPad 3G. So, can I trim my regular sim card and fit it on the iPad 3G. Will it works? I was wondering the same thing about the microSIM issue. I am positive that you can NOT cut/trim a normal SIM card to make it fit into the micro sim slot, as although it looks the same its really isnt. I have also read that European telecom companies are introducing the microsim as well, so i guess eventually it will be also out in this part of the world? To be on the safe side I think the 3G model would be better – if you would use that option that is. Hi all, just got an iPad. Everything is smooth. But I set up my iTunes account, and when I connect from the iPad, I got a message saying iTunes is not supported in this country. Any insight? Did you get a solution for connecting to the App store? I always connect ok with my iphone but the ipad says the App store isnt supported….